The recent fine weather has encouraged the early emergence of dragonflies and, appropriately, on St George’s Day we went dragon hunting. Our first Four-spotted Chasers were seen sunning themselves on reeds and bramble at Windmill Farm on The Lizard peninsula in Cornwall. 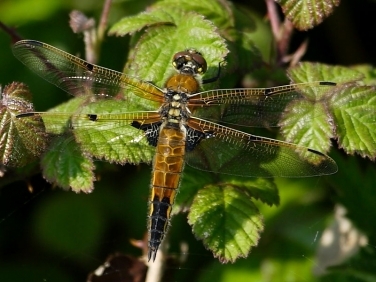 Insight into Four-spotted Chaser (Libellula quadrimaculata): a common, medium-sized dragonfly found throughout most lowlands of the UK but absent in parts of the north east. The species wanders extensively and therefore is often the first species to colonise newly flooded gravel pits. The females lay their eggs in a wide range of lowland waters such as bogs and slow moving streams. It’s a migrant and on the continent can periodically swarm in huge numbers comprising billions of insects.